Learn fractions and become a math wiz the fun way. 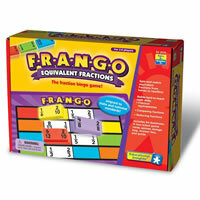 Frango is a great game that teaching kids how to compare fractions and understand the concept of division. Play the standard rules or you can play a variant of Frango that is similar to dominoes. Frango will get you thinking in fractions and will put your math skills to the test. Educational games are a great way to help teach and help players remember/learn fractions. Colorful game components and easy rules help this game be fun for all ages. Give Frango a try today. Be the first player to fill a horizontal row on your card with equivalent fractions. You get 84 plastic fraction dominoes, 6 double-sided game cards, game spinner, cloth storage bag, F-R-A-N-G-O answer key and the official F-R-A-N-G-O game rules and instructions. Please keep in mind that the official F-R-A-N-G-O childrens rules and instructions could be different depending on the game version you have. The rules below are some of the exact directions on how to play F-R-A-N-G-O. Share with us your comments, funny stories, tips, advice, strategies, creative ways to play, questions about how to play, problems with the rules or anything you want about F-R-A-N-G-O. All submissions will be reviewed within 24 hours. Click here to add your F-R-A-N-G-O comments.